The main aim of the third programme was not achieved with SYRIZA’s responsibility, said New Democracy (ND) leader Kyriakos Mitsotakis during a press conference on Sunday in Thessaloniki adding that “My commitment is the gradual de-escalation of the borrowing cost”. “I do not have the same programme with Tsipras. We want to reduce the taxes and the contributions and to reduce to state, Tsipras want to strengthen the state” said the main opposition leader adding that his target is 4 percent growth rate and the creation of 700,000 new job positions in the next five years. “We will wait to see the measures Mr. Tsipras will bring to parliament. Measures aligned with our logic that Tsipras is copying, we have no reason not to vote them” Mitsotakis said. The opposition leader promised to forgive old defaulted debts, pointing out that the ¾ of them involve amounts up to 3,000 euros. But such a decision will take off the hook both his ND party that owes to banks over 200,000,000 million and himself, from his family’s newspaper “Kirykas Chanion”. On the Prespes agreement he said that it produces results that are very difficult to be reversed. This can only be avoided with general elections, underlined Mitsotakis and clarified “I will not ratify the agreement with FYROM”. I do not accept a society that squeezes the middle class, said Mitsotakis adding that “my first target is the strengthening of the social mobility». He clarified that his party will not give vote of confidence to a government that will include SYRIZA. Referring to the markets he said that it is a priority and explained that the cash “pillow” is not to be spent but to help us tap the markets with safety. Asked on the ‘scandals’ Mitsotakis said that he totally trusts the Justice. He clarified that there will be no layoffs in the public sector but a strict framework in hirings and layoffs adding that he insists on the evaluation of the civil servants in order the really good to be rewarded. Mitsotakis said that there are no extreme-rights in New Democracy. “We have nothing in common with Matteo Salvini” he said. Prime Minister Alexis Tsipras’ press office on Sunday issued an announcement after the end of New Democracy (ND) leader Kyriakos Mitsotakis’ press conference at Thessaloniki International Fair. “In today’s press conference Mr. Mitsotakis without being pressed at all admitted that he intends to recourse anew to the IMF, he intends to leave in the air 1.5 pensioners as he insists on the Pinochet-type insurance system, he will undermine the labour rights and the labour law, he intends to apply the tax-free reduction asked by the IMF for 2020. Moreover, he will give amnesty to the tax evaders and will proceed to new cuts in salaries and pensions as well as layoffs. He does not intend to reduce the Real Estate Property Tax (ENFIA) and will not annul the Prespes agreement. 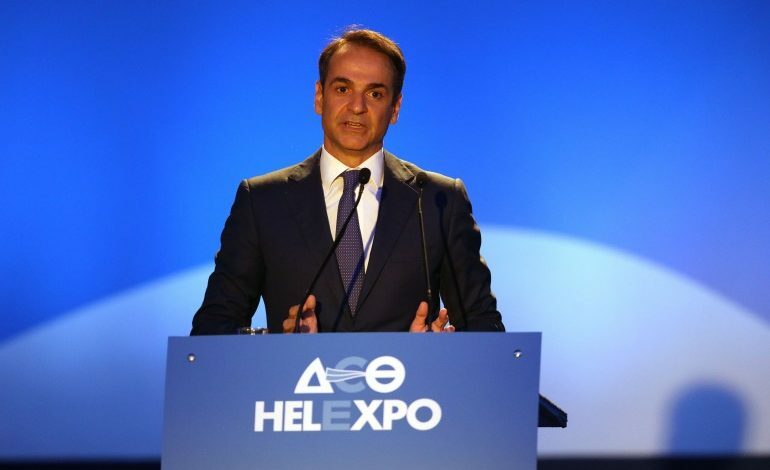 In short, Mr. Mitsotakis’ presence at Thessaloniki International Fair constitutes the best pre-elections material for the elections campaign for the general elections that will be held in October 2019.